Looking for some sites like Craigslist or want some alternatives to Craigslist to advertise your products online, then this topic is for you. No doubt, Craigslist is assumed to be the best place for product advertisement, due to its clear layout and advanced sites identifying technology. Also, there is a number of market advertiser preferred to promote their product locally on Craigslist. Being internet marketer, we want to sell our products on some suitable website online. Although there are a lot of websites alternatives to Craigslist available, we will rely on such that will not only boost our business but will also bring valuable customers. However, there is a number of persons that are not satisfied with their advertisement technology and other business features. So that’s why I have compiled a detailed list of sites like Craigslist that will bring new opportunities to promote your business locally as well as internationally with the target audience. Here is the detail of Sites Like Craigslist to promote your business online securely and confidently, don’t miss to visit these Craigslist alternatives websites. It is also the most Popular Website Like Craigslist. The user can find ads from local listing especially from USA, Canada, Europe, and other Asian countries as well. The best thing about City News is each classified ads creates a one-page website where you can post your ads along with the relevant image, video, and description. It also offers a Paid ad with nominal charges and will provide you the liberty to see you adds locally as well as internationally. It is one of the best USA based sites like Craigslist. It was started in 2010 and had provided a good space for business. Whether you want to sell your house or used a car or looking for someone to hire your property then Recycler is the best for you. When you sell on Recycler, you can quickly post your listings to Facebook and Twitter. To boost your exposure on Recycler, it’s also possible to use paid ads to target specific buyers or markets. Close 5 is formerly known as eBay classifieds, it is also a good place to find good customers or your products online, especially if you are in USA Moreover there is a listing for other products worldwide. The best thing among other sites like Craigslist is its user-friendly customer approach to sell products. The detail of each product is hidden under its display picture, so it will become easy for the customer to approach the products and its price. It is also one of the famous websites as Craigslist alternatives. The best thing about Ads Globe is its automatic location detection, while sign in through Facebook it will automatically detect user location and then Post or show adds accordingly. You can easily post unlimited free ads in any categories as real estate, events, business, dating/personal, pets, travel, jobs, and others. With a simple design and easy search approach, Hoobly has become one of the popular Portal to buy and sell a product online. Being Craigslist alternatives, there is a lot of opportunities both for the seller and buyer to search and find their products. Each listing is categories to find a suitable product. There is also an option of Post free adds, where a visitor can post a free add to sell his products worldwide. BackPage is another famous website to sell and buy your products and items, especially while living in USA, Canada, Europe and even worldwide. Each category is listed by country and then city vice, so it is a great place for local listing. Also, the user has a great variety to choose their own listing by promoting it with a picture, short video along with a description. Ooodle is slightly a different marketplace to promote websites like Craigslist. You can find your own listing as well as be listing from other relevant sites, this will provide a good variety to choose the products. The best thing is its social media interaction, you can use your existing Facebook account to log in and post your add on this website. As by name, Penny Saver USA is an online listing website is especially to promote business locally in the USA. Being a great opportunity for advertisement over the sites like Craigslist, it has been popular in the country over the 50 years. To post add, you must first sign in and then advertise. There is also a newspaper edition along with their online Portal, you can find your local listing there. US Free adds is also a free classified ads sites like Craigslist, you can sign in to post free add and search for a variety of other products like houses, cars, pets, and lot more. Although it is not so much attractive, however, the user can find much of his interest. Also one can get more benefits by sign up for a paid account. Locanto offers classified advertisement over 60 countries of the world. You will probably have the best opportunities with Locanto if you live in Los Angeles, Miami, or New York as those are their featured boards. It is free to post your ad to a city board, but, you can pay extra to extend the advertisement to additional cities, remove third-party ads from your listing, or send your ad to the top of a buyer’s search results. 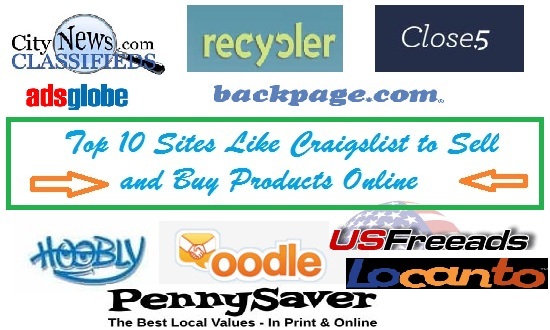 The above listing of sites like Craigslist will give you the opportunity to sell and buy your products online at local listing as well as worldwide. Do comments if you have any query or update the topic. thanks Rafaqat for sharing this helpful classified list can you please share social bookmarking list of 2017 with good alexa rank . This is the first time I am visiting this site and glad to see the very useful and amazing content you publish here. Looking forward to come back and read more updates in future too. Thanks for the good share. thanks and keep on visiting….